SoleScience is proud to have once again been a part of Operation Walk’s Guatemala mission this November. Operation Walk is a not-for-profit organization that provides hip and knee replacement surgeries to patients in developing countries like Guatemala and Ecuador. SoleScience’s role with operation walk is not only to provide post-operative pedorthic care to the surgical patients, but also to provide pedorthic care to those who are not candidates for surgery. Most of the patients we see on this mission require a shoe lift or other footwear modifications for a leg length discrepancy or congenital deformity. Our pedorthists provide the modifications needed as well as additional footwear when needed. 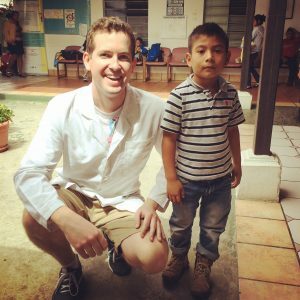 During the week of October 29- November 4th, Jeff and 72 other volunteers from Canada and the United States travelled to Antigua, Guatemala for the 11th annual Operation Walk campaign. During their stay there, 60 patients were operated on, while 71 joints, consisting of knees and hips, were replaced. The Operation Walk organizers saw this year as being a tremendous success as all cases ran smoothly and supplies were properly accounted for. SoleScience’s role in Operation Walk is to assess individuals for their respective problems and properly implement footwear modifications and recommendations as needed for each individual. In total Jeff saw over 25 patients during the 4 clinical days and did anywhere from 30-35 shoe modifications. These shoe modifications mainly consisted of shoe lifts due to leg length discrepancies and ranged everywhere from 6mm to 6cm in height. The one patient that comes to mind is Alejandro David (pictured below). This boy travelled by bus with his mom over 14 hours to be seen for a lift with the end result being and internal (within the shoe) lift so that he could still use it as he grows. — Jeff Walker C Ped (C).